Sander Boschker (born 20 October 1970 in Lichtenvoorde, Oost Gelre) is a Dutch footballer who currently plays for FC Twente, as a goalkeeper. Boschker made his professional debuts with FC Twente in 1989–90, appearing once with the first team; after an irregular beginning, he firmly established in the side's starting XI, amassing more than 400 official appearances for the Eredivisie club. Aged almost 33, Boschker moved to Ajax Amsterdam, but had to settle with battling for being backup, unable to dislodge youth product Maarten Stekelenburg. The following summer, he returned to Twente, adding next to 200 more official appearances (in 2008–09, he only missed five league contests for an eventual runner-up finish), and playing into his 40's. 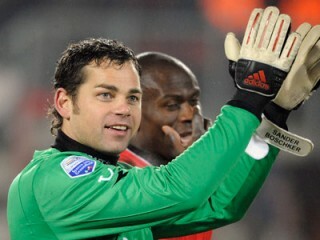 In the 2009–10 season, veteran Boschker featured in all 34 matches, as Twente won the first league title in the club's history; he only conceded 23 goals, second-best in the competition. This highly experienced stopper has enjoyed something of a renascence in his career as he sparkled in FC Twente's title success story in the season just gone and earned himself the third choice keeper berth in the Dutch World Cup squad as a result. Boschker served coach Steve McClaren well as the Englishman claimed glory in the Dutch title race back in May, with the stopper who has played close to 550 games for FC Twente rarely making a mistake as he kept 17 clean sheets in 34 games during a rock solid campaign. Agile, confident and providing a calming influence on those around him, Dutch coach Bert van Marwijk was clearly impressed with his form as rewarded him with a World Cup trip. "The season we enjoyed at Twente was perfect in many ways and now I have this extra bonus of being given the chance to go to South Africa," says Boschker. "It may be tough for me to play in the World Cup, but this is still a highlight of my career." View the full website biography of Sander Boschker.